What Are the Most Popular Materials for Pool Decks? Are you thinking of having a company like VistaPro Landscape & Design install a new pool deck around your pool this coming summer? Here are some things to keep in mind when selecting the kind of deck you’ll ultimately get installed. Many in-ground pool decks are made of concrete. Available in a variety of colors, concrete makes for a smooth surround that’s clean, easy-to-maintain, and doesn’t get too hot when the temperature rises. Concrete feels good underfoot. If you do choose concrete, consider having a textured finish so it’s less slippery. How about brick around the pool? Like concrete, brick is easy-to-maintain. It’s also durable and, having been around for thousands of years, it’s a proven surface material. One thing to watch out for, though, is moss growing on brick, which can make it slippery. What about pavers, which can be made from stone, concrete and/or aggregate? Pavers have become popular during the past few years, especially the interlocking kind which are a nice alternative to the more plain-looking concrete decks. 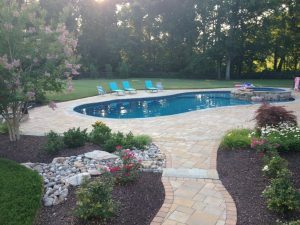 Pavers give an interesting look to the area surrounding a pool– they can resemble cobblestones, for instance, or granite, tile and/or bricks. If and when something goes wrong with one paver, it can be easily replaced. That said, pavers will need some sort of permanent border or frame around the perimeter to prevent shifting. Are you considering a wood deck? This is such a natural looking material to use and can look so attractive. However, with wood you’ve got some maintenance to consider: cleaning, sanding, sealing, painting, and splintering are all terms associated with wood decks. Another natural looking material for your pool deck would be stone. Flat stones often used around pools include quartzite, sandstone, and limestone. They come in a variety of shapes. Keep in mind that darker stones can become hot underfoot. Of course, you could use tile for your pool deck. With tile, good choices include unglazed terracotta or water-impervious porcelain. Be careful with how slippery tile can be, especially when wet. Want to discuss pool deck materials with an expert? Call VistaPro Landscape & Design today at 301-805-0119 or email vistapro@vistaprolandscape.com.